"I just took a leap of faith and decided I had nothing to lose to try this program." "I just wanted to say thank you, I somehow found Iris Grace's page which brought me here and I just took a leap of faith and decided I had nothing to lose to try this program. My son Z has just turned 3 in November and I have been trying just about everything to get him to talk. He has just about zero clear words (other than "mommy, and no") and he is undiagnosed with anything. He is extremely bright, it's if he moves too fast, his mind is so busy he can't slow down enough to get words out. When he does they are incorrect, as if he has articulation problems. Example I'll say "Dino" he'll say "diyou". He has been going to school for his early childhood program for three months now and though his behavior has gotten better (following directions) his words haven't seemed to change. He has been doing speech therapy every two weeks since he was two. 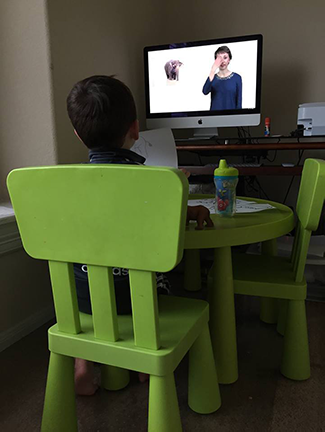 I started your program two days ago, first day he was actually trying to say fish and we watched for an hour after school during his dinner time. Second day, again after school during his dinner. He said bear and lizard almost clearly...I almost cried. I can't wait to see how he is progressing a month from now. I'm so excited. This is Z watching and holding up his elephant picture that he sorted out of the pile of animals himself."